St. Nicholas Day. Did you miss this Christmas tradition on December 6th? NE Wisconsin’s population is heavy with families that can trace their heritage back to Northern Europe to the countries of Holland, Germany, Poland, and Denmark. St. Nicholas makes his visit prior to Christmas to small children with treats for good little girls and boys and lumps of coal for those not so good. On the Eve of St. Nicholas (Dec. 5th), children leave their shoes or stockings outside the door of their bedroom or by the fireplace. Then the next morning they hopefully find chocolates,nuts, popcorn balls, coins, or a small toy left by St. Nicholas. My family did not practice the tradition of putting up stockings. It was not until my future sister-in-law entered the picture and was shocked that my brother did not have one. She quickly whipped him up one and so the tradition began, but not on St. Nicholas Day, instead we did this on Christmas Eve. When moving to Wisconsin, I was surprised to learn about St. Nicholas Day and find out how widely it is practiced on the west side of Lake Michigan. Which leads me to my next discovery. 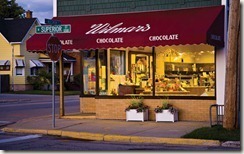 NE Wisconsin has a very thriving “candy wonderland”, shops that carry hand made, hand cut, and hand wrapped confections that are used for St. Nicholas Day and for other holidays and special occasions. In one day you could do a 150 mile drive and visit 7 locally famous shops that are continuing their candy making tradition into the 4th and 5th generation. Of course, you would need some Pepto Bismol following such a trek. Being in the middle of the dairy belt, fresh butter and cream are a couple of the necessary ingredients and can be found local creameries. So it is natural for many, once mom and pop shops, to be still thriving into the 21st century. The Dutch and Germans are particular about their chocolates and Russell Stover and Doug Murdock fudge, which I am most familiar with, are not high on their list or even on it. Shoppers flock to these little shops on the holidays and don’t even flinch at the prices they must pay for these carefully crafted delights. Last Christmas, Jon and I traveled north to De Pere, just south of Green Bay, to Seroogys. This shop is nationally known and on most tour bus stops. The big seller there is the “Meltaway” chocolates. Jon takes a box into his co-workers every Christmas and is instantly the most popular guy in the office. 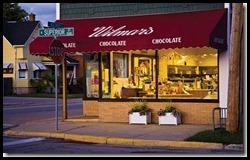 Yesterday we decided to try the local confectioner, just down the street, Wilmars. This shop looks like it a miniature Dept. 51 Christmas Village shop. It is very charming with old fashioned awnings and large store front windows located on the corner of a busy street and older Appleton neighborhood. The parking lot was full as we approached. As we entered the store, we were immediately greeted by a little elderly lady that sported a tray of chocolates and asked us if we would like to sample. Us? Of course we would. The tiny store was crowded with shoppers getting their gifts and stocking fillers. The store has been there a long time, gauged by the tin ceiling and other antiquated décor, slightly modernized.The candies ranging from homemade popcorn balls, to creamy caramels, and a variety of gourmet chocolates are pricey. But you can tell that it is choice gift to give, by the wide range of shoppers, young and old, that I saw patiently waiting to check out. Jon said when he was growing up his family whipped up a batch of homemade turtles, chocolate and caramel covered pecans or they purchased a box just for Christmas. My father made fudge, which was surprisingly the only thing he knew how to cook. I remember my mom buying a box of chocolates for her father. It is a special treat that one does not purchase for oneself. It is a time honored tradition, just like St.Nicholas Day here in Wisconsin. It is a time to forget about that fact that it is not good for the diet, unless, of course it is dark chocolate. So may you and yours find such a delightful confection under your tree, in your stocking, or most importantly in your mouth this Christmas.